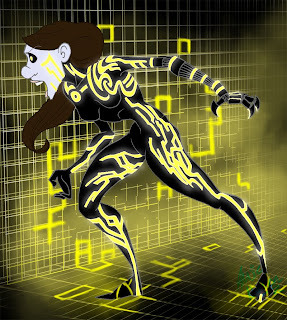 I may have been playing the hell out of Tron video games lately. I'm curious as to why one of the movies doesn't have any of the viruses in it- or the Isos. So many story opportunities there! Anyways, despite my crippling fear of zombies, I'm quite fond of the corrupted- they're a lot like zombies themselves. I sense I'm in a TRON kick again, so be afraid. Be very afraid. I wonder who I'll draw next!